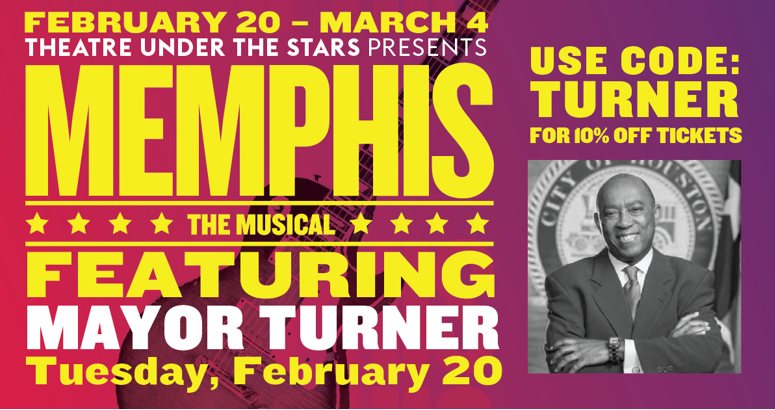 February 20, 2018 -- Mayor Sylvester Turner will join Theatre Under the Stars tonight in a walk-on role in a performance of the Tony Award-winning musical Memphis!. Inspired by actual events, Memphis is about a white radio DJ who wants to change the world and a black club singer ready for her big break. The musical comes alive with explosive dancing, irresistible songs and a thrilling tale of fame and forbidden love. Tonight’s showtime is 7:30 at Hobby Center - Sarofim Hall. Media are welcome to bring cameras and capture photos or video of Mayor Turner’s stage appearance. Contact Lisa Holmes, Manager of Public Relations at TUTS, to make arrangements. 713-249-2491, lisa@tuts.com. For more information about tonight’s show and other productions, visit https://www.tuts.com/.